Vans Warped Tour 2012 … Coming to a parking lot near you. Some concerts are better outdoors. Some are even better just outside the stadium. The Vans Warped Tour is one of those events. It is better when it is in the parking lot. When the 2012 Vans Warped Tour arrived in the Bay Area, the music festival stopped next to AT&T Park in downtown San Francisco. The festival sold out. 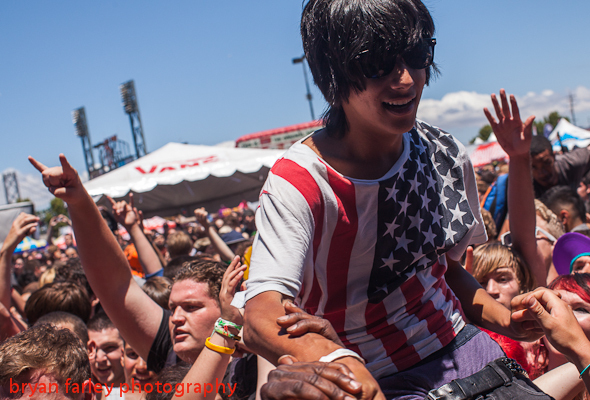 When I photographed Vans Warped the last two years at Shoreline Amphitheatre near San Jose, California, the event felt cramped despite the amazing energy. There are approximately 80 bands performing on seven stages. There are vendors, non-profits and demonstration areas. I photographed about twenty bands. I took nearly 2,000 photos. A San Diego band, Pierce The Veil, performed on one of the main stages towards the end of the day. There are several bands that I wish I could follow during the summer, or at least shoot a few more times. Pierce The Veil is one of those bands. As more photos are published, I will write more. Until then, you can go to my website to see the processed photos from Saturday 23, 2012. You may wish to view the slideshow in this format too. From here, you can share individual photos and move through the large galleries more quickly. This entry was posted on Saturday, June 30th, 2012 at 11:05 pm. It is filed under Music Photography and tagged with concert, San Francisco. You can follow any responses to this entry through the RSS 2.0 feed. Pierce the Veil is actually one of my best friend’s favorite bands. She would have been so excited to be there especially if she had the chance to photograph with a DSLR. As for the space issue, I’ve come across two groups of thought. The first regards the density of people as an unfortunate “side-effect” as they are there for the music, whereas the second comes for the whole of the experience, appreciating even kicks in the head, as one of my friends put it. At Warped, almost everyone seems fine with being kicked in the head. (People do not really get kicked.) I saw one person being taken away in an ambulance, but I do not think the person was kicked in the head. With more than 20,000 people in one place all day, there was a good chance that someone would leave in an ambulance… it was probably just the odds of having that many people in one place. Security is amazing. They are vigilant. As the photographer, I am grateful, but also a little frustrated. Usually I would rather have a little more chaos, but security keeps everything under control… probably more under control than it appears.